Annual herb from a taproot; stems freely branched, 10-50 cm tall, glabrous, base of lower stems often decumbent. Basal leaves widely egg- or spoon-shaped, fleshy, deeply toothed to wavy-margined and saw-toothed, with a broad stalk, 2-7 cm long; stem leaves similar. Inflorescence a raceme, 4-15 cm long; flower stalks 3-7 mm long, stout, ascending; petals white to purplish-tinged, 6-8 mm long; sepals sparsely soft-hairy at tip, early deciduous, 3-4 mm long. Siliques, 1.5-2.5 cm long, slightly to considerably constricted at the joints, the upper segment triangular to egg-shaped, constricted to somewhat flattened beak, tip acute to notched. 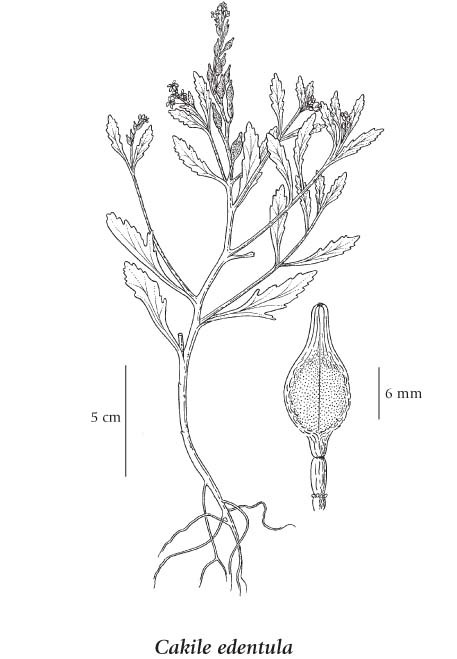 Source: Illustrated Flora of British Columbia. Moist to wet sandy shorelines in the lowland zone; common in coastal BC; N to AK and S to CA, also along the Great Lakes and the Atlantic Coast.